Factory design pattern is used for creating an object based on different parameters. The example below is about creating human in a factory. If we ask the factory for a boy, the factory will produce a boy; if we ask for a girl, the factory will produce a girl. Based on different parameters, the factory produce different stuff. Based on different parameter, getInstance() returns a different instance of Calendar. You can view the source code of Calendar and NumberFormat in javased.com. 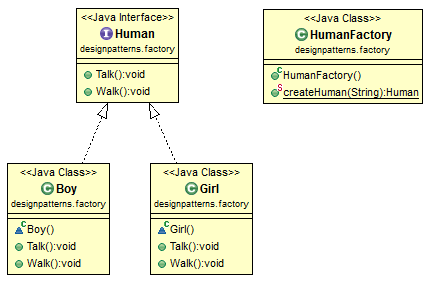 Thanks for good explanation…..please go through this blog http://adnjavainterview.blogspot.in/2015/07/factory-design-pattern-in-java.html also explained good.. I don’t understand your question, can you be more specific? Glad to know the post is useful to you. Thanks for subscribing! for instance if you got a list of classes that inherits a mother class ? In HumanFactory for string comparison should m.equals(“boy”) / m.equals(“girl”) be used? Good tutorial for this design pattern! I couldn’t find out some examples like this (easy and not confused haha) I’ll subscribe me to your newsletter. Good bye and greetings from Argentina ! Buen tutorial para este modelo de diseño! No pude encontrar algunos ejemplos como este (fácil y no confundir jaja) me voy a suscribirse a su boletín de noticias. Adiós y saludos desde Argentina! it s very good but this procedural approach is not a good idea in OOPS. if we have 10 or 20 classes implemented the Human interface . crateHuman(String) by String will be unreadable. so in a standard way you can use class registration with or without to avoid if else check in factory. since java reflection affects the performance by 10% . you can go with class registration without reflection . Load all the classes before registering into factory using Class.forName() in order for this to work .